Things get busy for Detective Mel Carter when her partner goes on holidays. Just two weeks apart there’s a fatal road crash and then the discovery of human remains, both on Kellers Way. Mel discovers that the murder of Laura West is not a closed case and that the trail of clues is not as clear as she had thought. Is the obvious suspect really the murderer? Or has an innocent person been condemned? This is the first novel from Megan Goldin, a former Middle East and Asia correspondant for the ABC and Reuters. I have really enjoyed reading crime fiction that’s set in Australia, and particularly around Melbourne and Victoria. 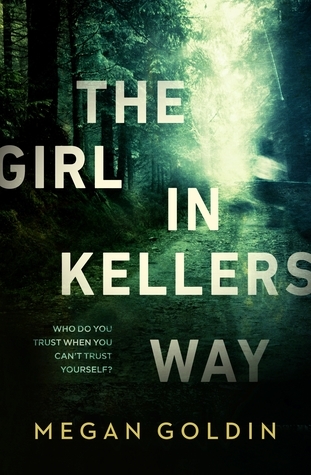 As Goldin is now based in Melbourne, I expected Kellers Way to be a fictional road somewhere in Victoria, so I was disappointed at first to find the story set in small town America. It’s not that all writers have to base their work close to home but I couldn’t see a reason for The Girl in Kellers Way to be set in the States. While I was coming to terms with place in this story I was also frustrated by a few niggling inconsistencies in the book. Particularly in the opening pages, I was confused by sudden shifts in time and tense. Like on the first page, where Julie says that after finding her running shoes she has since run every day. Yet there are days and weeks in the story that follows where a run would be out of the question. These few gripes however were not enough to make me put the book down. It wasn’t long before this story’s puzzle had me hooked. Is Julie West the loyal wife of a sadistic philanderer or an unstable and untrustworthy alcoholic bent on revenge? Goldin builds Julie’s character around lots of detail of middle class domestic life, yet with an undertone of suspense and suspicion. Julie is from a poor background and her perspective on her middle class privilege is always that of an outsider. We see her with her daughter Alice in the family car, at ballet lessons and visiting her husband’s university campus and lecture theatre, but her reasons for doing so are fraught with suspicion. Goldin throws plenty of red herrings in the reader’s path, enough to have me constantly second-guessing my own conclusions. I was very satisfyingly on my toes for much of the novel. The steady and believable second narrator, Detective Mel Carter, gives us regular respite from the rollercoaster of Julie West’s perspective, as well as some excellent insights into detective procedure – as well as a very unusual poison. Detective Carter is also a mum (going it alone after the death of her policeman husband in a shoot out) and she is trying to juggle the needs of her two young sons with the ever-increasing demands of two homicide investigations. It’s Carter’s task to uncover the secrets and motives that link Julie and Mathew West, and their former partners. The completed jigsaw puzzle is a domestic noir of love eclipsed by ambition, jealousy and revenge. I was still guessing until the final pages of the book. The story’s climax didn’t quite, I think, live up to the strengths of the twists and turns in Goldin’s plot. The ending left me hanging. It seemed to be intentionally unresolved. Will there be a sequel? I hope so.